Coho Ecovillage is a 34-unit cohousing community, a mile and a half from downtown Corvallis, and close to public transportation and numerous bike and walking paths. 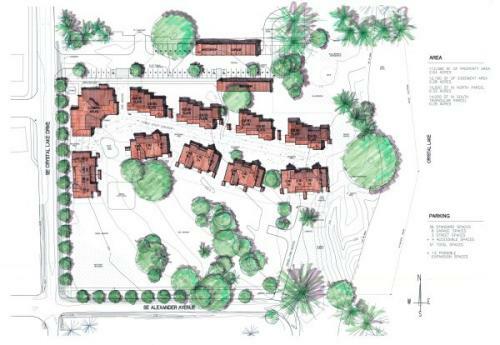 Clustered on 6.8 acres and surrounded by trees and meadows, the units are a mix of flats and townhouses, all designed to support friendly interactions between neighbors. A large common house with a unique solar art installation is the gathering place for meetings, vegetarian meals, and recreational activities. Members of Coho Ecovillage are committed to living lightly on the land, embracing diversity and sharing with one another in mutual trust, respect, and support. All learn to listen carefully, use nonviolent communication, and make decisions by consensus. Since moving into our community beginning October 2007, and we've been busy doing landscaping, building compost piles, planting gardens and an orchard, and getting to know each other better. Our residents range in age from infants to grandparents--currently there are 105 folks in our community (two thirds live on-site; one-third who live off-site are Friends of CoHo, Associate Members, or Non-Resident owners). The overall adult to kid balance is about 3 to 1. We are a mix of income levels, abilities, and family composition. Twenty-six of our 34 townhouses and flats are handicap visitable, and all downstairs flats meet ADA-accessibility standards. If you are interested, visit our website and/or come for a tour. We would love to hear from you.